Abraham Lincoln’s famous proclamation is as true of our global human presence as it is of houses. In his case he meant the evils of slavery and the bitter and tragic American Civil War kept the ‘house’ standing, even though its ‘divisions’ remain apparent. Enough about that. It’s merely background for the subject at hand, which is the impending disappearance of yet another species. What makes the subject relevant is that the species headed for extinction is humanity itself. Those who are presently alive on this planet, such as you and I, who will witness the early stages of our undoing, along with those who come after us. What gives it further relevancy is the elephant in the room. We worry (and do nothing) about climate change, fret (and do nothing) about the dangers of unfettered capitalism, highlight the horrors (and do nothing) of floating islands of plastic the size of the state of Texas in our oceans and debate (while doing nothing) our concerns for social justice and wage-equity in the newspapers and on social media. The elephant in the room is population and it comes as no surprise that we will do nothing about that either. In the year that I was born, the human population of the world was 1.6 billion. Growing up, there were woods nearby, farms just outside the city and we walked or bicycled to school with our neighborhood chums. When I turned twenty and had some sense of the circumstances surrounding me in Chicago, it had reached 2.8 billion but it was still what I would now term a very visually attractive, safe and friendly surrounding. Doors were largely left unlocked, families had dinner together and we knew our neighbors. To be rich was to be worth a million dollars and those fortunate enough to attain such wealth lived in the nicer homes among the middle class. The billionaire had not yet been invented and the gated-community was still unknown. Now, some six decades later, all that has been swept away. It took all of human history (30 thousand years, depending upon who’s counting) until 1820 for the planet to reach its first billion inhabitants. A hundred ten years later we had doubled that number to two billion. Forty-five years later we had doubled it again to four billion. Forty-five years on we have doubled it yet again to nearly eight. Unrestrained growth is the defining character of the cancer cell. Yet you have to search, and search hard, to find any plausible conversation or debate on what such unrestrained growth means for the survival of the human species. What has never been dis-proven is that what is unsustainable cannot be sustained. By definition it is a fact. So it’s not much of a stretch to realize that any species doubling and redoubling itself in so short a period is in trouble. Added to all those earlier mentioned social and ecological disasters we do nothing about, concentrate your mind upon this as just one more. Population growth is the elephant in the room, the driving force behind all the others. Largely because of our devotion to political correctness, it has become impossible to point a finger at ourselves for breeding like rabbits. The largest growth is in the poorest areas and it is now racist for the better off to blame their poorer brothers. That is an obviously eloquent and correct observation, but it doesn’t solve the problem. So what will solve the problem? Well folks, tighten your seat-belts, because it’s going to be a bumpy landing. The great likelihood is that it will not be the human species. Sorry ‘bout that, but with all our intellectual capacity and problem-solving talents, we humans are short-term thinkers in a long-term game. This, above all else, has moved us considerably beyond our sell-by date as a species. The most likely outcome is that the planet itself will solve the problem and humanity will go down as yet just another of its failed experiments. Blame it on Darwin. It may have taken 30,000 years for the human train to build a head of steam, but we’re rocketing now and there are no more rails available to sustain the trip. The seas will rise. The agricultural basis of human life will fail us due to changing weather patterns. 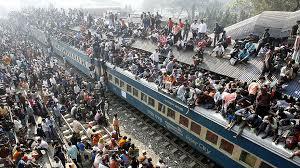 Eighty million Bangladeshis will flee or drown in place, along with billions of others in coastal or riverside cities. Deadly viruses with no known antibiotics will escape hospitals or occur in nature, bringing plagues such as the world has never seen. And that’s just the scenario on our way to extinction. That’s coming in the near-term, quite probably within the next century. In the longer term, as man-made systems continue to collapse, we don’t really know when the last human standing will fall. But cheer up, plastic will remain as our marker for having been here. As for the planet, it will shake off its brief and failed experiment with humanity and continue to thrive. It will make what is a planetary short-term recovery from all traces of mankind (except for plastic). A thousand (or a million) years, is merely an eye-wink in planetary time. Just because Darwin was human doesn’t mean Darwinism will not continue after we have gone. Certain present-time species will continue to exist and thrive without all that messy and negative human intervention. Bees, crows, sharks and crocodiles will probably make it, along with cockroaches, as they all predated humans. Possibly even some form of chimpanzee or great ape, which would give humanity another more honorable chance at the game. But left to its own devices nature is an intrepid opportunist and this lovely blue dot we leave behind will become only more incredibly blue and evermore lovely. That’s what I never truly understood about those who would scheme and dream about beginning life on Mars (hello, Egon Musk, good to see you), or some other unfriendly and desolate rock of a planet. Why, when it was within our intellectual and technical power to foresee and ameliorate, have we so willingly (or ignorantly) abandoned such a paradise?